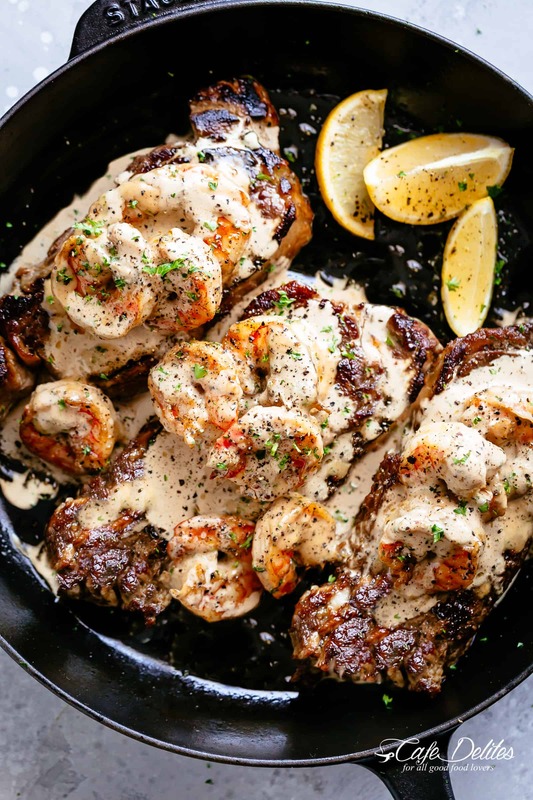 Steak & Creamy Garlic Shrimp is an incredible and easy to make gourmet steak recipe! Pan Seared OR Grilled Surf and Turf! 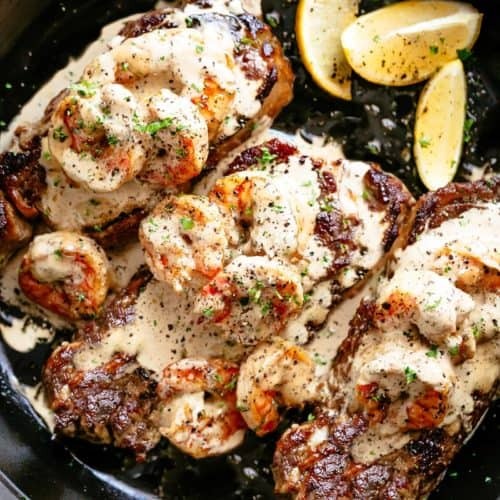 Leave people wondering if there is a hidden chef in your kitchen with this steak and creamy shrimp dinner! Ready on the table in less than 15 minutes, it’s the flavours in that rich and creamy garlic sauce with a hint of parmesan that is out of this world good! Tastes just like Surf And Turf right out of a restaurant… you will even impress yourself! 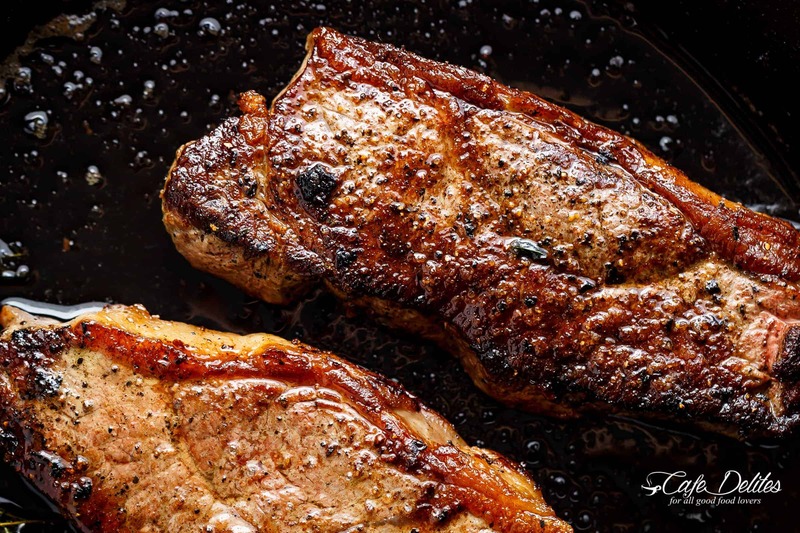 Perfect with juicy, melt in your mouth steaks! 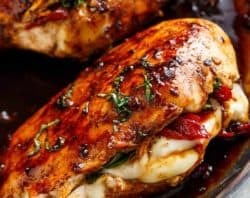 Another amazing low carb recipe! Tips to get tender, juicy steaks! Let steaks sit out at room temperature for 15-30 minutes. Pat dry with paper towel. Season generously on each side with salt and pepper. Using a cast iron skillet provides steaks with even cooking and the best, charred flavours similar to a barbecue, but any pan will work. Preheat your pan on high heat before carefully adding your oil. When your skillet is smoking, season steaks with salt and pepper just before they go in to your pan. Your kitchen will get smokey! Keep your exhaust fan on high. Add only two steaks in at a time, or you won’t get a nice sear. Set up the grill at least 15 minutes before you cook. It needs to get hot before putting anything on it. Find the hottest areas by carefully and slowly waving your hand 6 inches above the grill. Using tongs, lightly grease grill plates with a folded paper towel dipped in oil. When oil is smoking, grill until they release without sticking. Remember, steak will continue to cook after being removed from the skillet or grill. Allow to rest for 5 – 10 minutes to let the juices settle before serving. 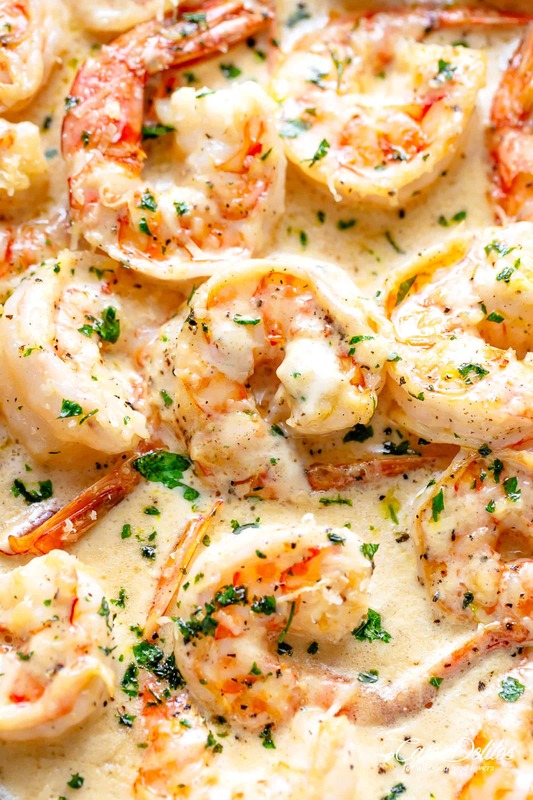 While steaks are resting, sear (or grill) your shrimp, then get your creamy sauce going! If grilling your meat/seafood, you will need to grab a pan to cook the cream in. Heavy (thickened) cream can be substituted with half and half, light cream or evaporated milk! What wine goes well with Steak Recipe? I choose a white wine to go with this. A light Chardonnay or Pinot Gris pairs really well. I also love a chilled glass or Rosé. Watch us make this Steak recipe right here! Looking for more steak or shrimp recipes? Try these! 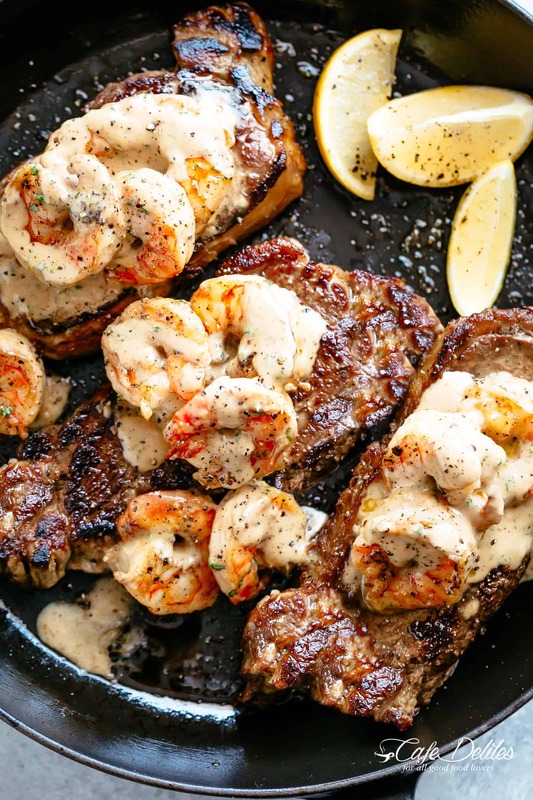 Steak And Creamy Garlic Shrimp is an incredible easy to make gourmet steak dinner! Pan Seared OR Grilled! Tastes just like something out of a restaurant, this low carb steak recipe is ready on the table in less than 15 minutes. The sauce is out of this world...you will even impress yourself! Pat steaks dry with paper towel. Season with salt and pepper. Heat a large cast iron skillet or grill over medium-high heat. Sear/grill steaks for 4-5 minutes each side until browned and cooked to desired doneness. Transfer steaks to a warm plate; set aside. Melt 2 tablespoons butter in the skillet (if using a skillet). Add shrimp to the skillet, season with salt and pepper and sear until just cooked and pink -- about 2 minutes. Transfer to a bowl; set aside. To the same skillet, add the remaining butter, add the garlic, sauté until fragrant (about one minute). Pour in the white wine (or broth), and allow to reduce to half, while scraping any bits off of the bottom of the pan. Reduce heat to low-medium heat, add the cream and bring to a simmer, while stirring occasionally. Add in the parmesan cheese; allow to melt through the simmering sauce. Season with salt and pepper to your taste. Add the shrimp back into the pan; sprinkle with the parsley, and stir through. For steaks, you can use Strip, Sirloin, Rib eye, T-bone, Eye fillet, Scotch fillet or Porterhouse steaks. *Heavy (thickened) cream can be substituted with half and half, light cream or evaporated milk. 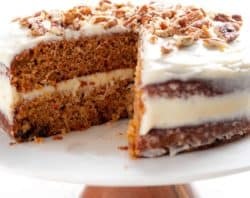 So I’m a little late, I’ve made this recipe twice already. But Holy freaking cow! I found this recipe on pinterest. I actually only made the shrimp sauce recipe, I used it in noodles, kind of like a cream fettuccine dish. So amazing! I played with seasonings like cajun and Tonys creole seasoning. Its so quick and easy. Its my go to for creamy pasta sauce! 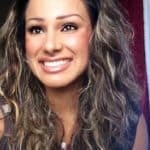 Hi, I LOVE your recipes! 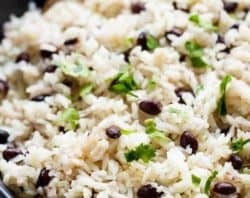 I also have mushrooms in the fridge along with my steak and shrimp and I wanted to use them in this recipe. What step would I incorporate them in at? After I cook my steaks or after I cook the shrimp but before the sauce? It depends. If you’re wanting to include the mushrooms in the sauce, add them in with the butter, sauté them, then add the garlic and continue with the sauce instructions from there. They can be prepared after the steak, but before the shrimp as they take a little longer to cook. I hope that helps! 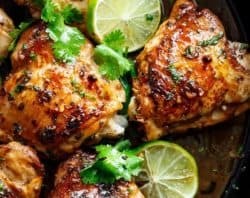 Do you turn the heat down when making the sauce or does it stay at medium-high? 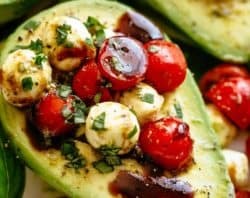 Do you have more keto friendly recipes.? 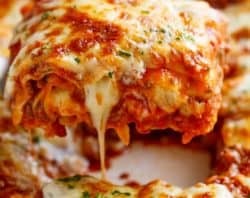 Can I make this without the wine? When yousay cream? What type of cream? What do I look when going to the grocery store? Just made this tonight and it was very good. I will definitely be making it again. Thanks! I cooked 4 steaks in my cast iron skillet using these instructions. They turned out great ! I LOVE all your recipes. When not sure what to make for dinner, I head to Café Delites and there is always something quick and very flavourful here!! I have been trying to cut out the lactose lately. Will Coconut cream work here too? Yes, that sounds great! I think you will love it! Thanks so much for following along with me and sharing!